Kalakand is an Indian milk fudge which needs no introduction. Condensed milk adds a nice creaminess to any mithai and also reduces its cooking time. 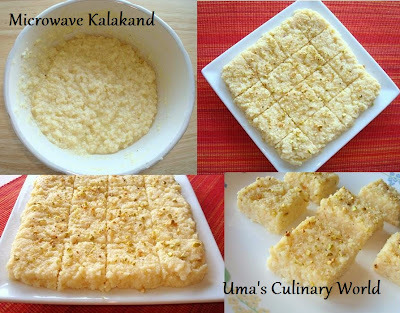 If you are looking for a hassle free and shortcut version of Kalakand, this microwave recipe is perfect. Crush the cardamom seeds and saffron strands in a mortar pestle to a fine powder. Finely chop pistachios or any nuts of your choice. Grease a big microwave safe bowl with few drops of ghee. Add condensed milk and ricotta cheese. Stir with a spoon so that ricotta cheese lumps are dissolved. Ricotta cheese works great as a substitute for fresh paneer/Indian cottage cheese. Microwave this milk and cheese mix for about 10 minutes. After every 2 minutes, stir with a spoon. Microwave again for 8 - 9 minutes. Keep checking and stir after every 1 minute to avoid burning. I microwaved this Kalakand mix for 19 minutes. This time may vary depending on the microwave. Add cardamom and saffron. Microwave it for a couple minutes more or less until it turns granular and moisture is lost. Grease a plate with few drops of ghee or butter. Spread the hot mix evenly and garnish with chopped nuts. While the mix is still hot, make cuts with a knife to form squares. Let it cool before cutting the square pieces. Keep it refrigerated. Serve Kalakand in cup cake liners. Super irresistible kalakand, love this shortcut methoda anytime. I tried your recipe at home "EGG CURRY" it was awesome!! Hey Harman, it is always gratifying to know that my recipes are loved. Glad to know that you tried and loved Kalakand. I appreciate your feedback. Hi ManasMom, am happy that you loved both kalakand and val papdi. To avoid this oozing thing, I use a big bowl and stop the microwave after every 1 minute. Hello Sonya! I haven't tried milk powder. My guess is Kalakand might get a little dry with milk powder as compared to condensed milk. easy recipie ... i made it and came out well!! Hi Uma, I tried this yesterday. The taste was fine, but it was a bit more chewy than i expected it. Is it supposed to be a bit chewy? ( i might be confusing it with milk cake). I was wondering if i overmixed the paneer and condensed milk mix. But, was hoping to get some thoughts from you. I have always used ricotta, didn't try with paneer. Ricotta is definitely more soft than paneer. Paneer sometimes gets chewy or hard if overcooked.